Brian A. LaMacchia, Sebastian Lange, Matthew Lyons, Rudi Martin and Kevin T. Price. 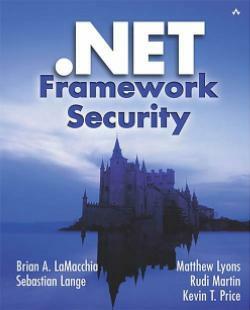 The definitive reference guide to the Microsoft .NET Framework security system. Order this book from Amazon or Barnes & Noble. Brian A. LaMacchia, Kristin Lauter and Anton Mityagin. Stronger Security of Authenticated Key Exchange. Proceedings of ProvSec2007. Barbara L. Fox and Brian A. LaMacchia. Encouraging recognition of fair uses in DRM systems. Communications of the ACM, Vol. 46, No. 4 (April 2003), 74-83. Brian A. LaMacchia, Key Challenges in DRM: An Industry Perspective, Proceedings of the 2002 ACM Workshop on Digital Rights Management, J. Feigenbaum, ed., Lecture Notes in Computer Science 2696, Springer-Verlag, NY (2003). Barbara L. Fox and Brian A. LaMacchia, Online Certificate Status Checking in Financial Transactions: The Case for Re-issuance, Advances in Cryptology: Proceedings of Financial Cryptography '99, M. Franklin, ed., Lecture Notes in Computer Science 1648, Springer-Verlag, NY (1999), 104-117. Barbara L. Fox and Brian A. LaMacchia, Cooperative Security: A Model for the New Enterprise, Proceedings of the Seventh IEEE International Workshops on Enabling Technologies: Infrastructure for Collaborative Enterprises (WET ICE '98), Stanford, CA, June 1998, 314-319. Barbara L. Fox and Brian A. LaMacchia, Certificate Revocation: Mechanics and Meaning, Advances in Cryptology: Proceedings of Financial Cryptography '98, R. Hirschfeld, ed., Lecture Notes in Computer Science 1465, Springer-Verlag, NY (1998), 158-164. Lorrie Faith Cranor and Brian A. LaMacchia. Spam! Communications of the ACM, Vol. 41, No. 8 (Aug. 1998), 74-83. Yang-Hua Chu, Joan Feigenbaum, Brian LaMacchia, Paul Resnick and Martin Strauss, REFEREE: Trust Management for Web Applications, Proceedings of the Sixth International World Wide Web Conference, Santa Clara, CA, April 1997. Reprinted in Computer Networks and ISDN Systems 29 (1997), 953-964. Brian A. LaMacchia, The Internet Fish Construction Kit, Proceedings of the Sixth International World Wide Web Conference, Santa Clara, CA, April 1997. Reprinted in Computer Networks and ISDN Systems 29 (1997), 1237-1248. Brian A. LaMacchia, Internet Fish, Ph.D. Thesis, Dept. of Elect. Eng. and Comp. Sci., Massachusetts Institute of Technology, Cambridge, MA (1996). Also available as AI Technical Report 1579, MIT Artificial Intelligence Laboratory, Cambridge, MA (1996). M. J. Coster, A. Joux, B. A. LaMacchia, A. M. Odlyzko, C.-P. Schnorr and J. Stern, Improved low-density subset sum algorithms, Computational Complexity 2 (1992), 111-128. M. J. Coster, B. A. LaMacchia, A. M. Odlyzko and C.-P. Schnorr, An improved low-density subset sum algorithm, Advances in Cryptology: Proceedings of Eurocrypt '91, D. W. Davies, ed., Lecture Notes in Computer Science 547, Springer-Verlag, NY (1991), 54-67. Brian A. LaMacchia, Basis Reduction Algorithms and Subset Sum Problems, SM Thesis, Dept. of Elect. Eng. and Comp. Sci., Massachusetts Institute of Technology, Cambridge, MA (1991). Also available as AI Technical Report 1283, MIT Artificial Intelligence Laboratory, Cambridge, MA (1991). Brian A. LaMacchia and Andrew M. Odlyzko, Computation of Discrete Logarithms in Prime Fields, Designs, Codes and Cryptography 1 (1991), 47-62. Brian A. LaMacchia and Andrew M. Odlyzko, Solving Large Sparse Linear Systems over Finite Fields, Advances in Cryptology: Proceedings of Crypto '90, A. Menezes, S. Vanstone, eds., Lecture Notes in Computer Science 537, Springer-Verlag, NY (1991), 109-133. Brian A. LaMacchia, Precision Measurements of Chaotic Circuits, SB Thesis, Dept. of Elect. Eng. and Comp. Sci., Massachusetts Institute of Technology, Cambridge, MA (1990). B. A. LaMacchia and J. Nieh, The Standard Map Machine, AI Memo 1165, Artificial Intelligence Laboratory, Massachusetts Institute of Technology, Cambridge, MA (1989).